It is hard to see but it looks that she is totally ignoring the OK sign perhaps knowing that it has been left out. Therefore it should also be left out of the score. The following shows another example where the conductor uses the ConDiS to make spontaneous volume control. 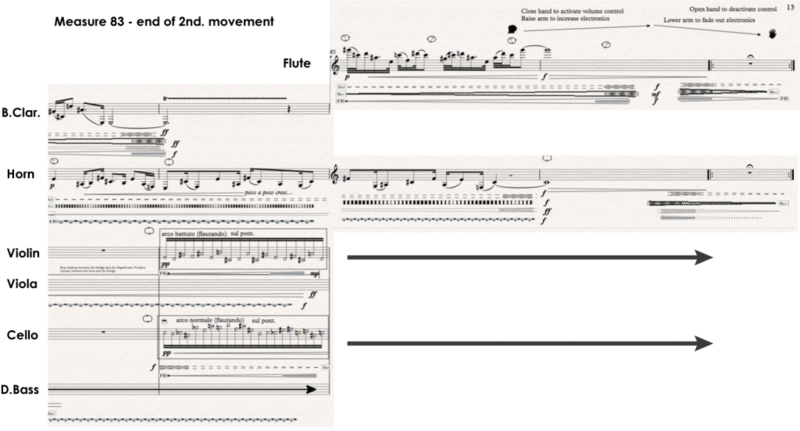 In measure 46 when the Horn enters (red arrow) she immediately brings down the volume value and keeps it low until measure 49 when the cello enters with pizzicato and a knock on body sound followed by vertical bowing tremolo and glissando (red arrow). Once again the conductor uses her musical intuition by keeping the Horn electronic levels all the way down to emphasize the electronics of the cello electronics with the pizzicato, knock and glissando sound. This example shows how the conductor controls the volume value in measures 56-60. At the beginning of this example, the electronic sound is rather loud and the conductor decides to lower it a bit and then plays a with the volume control like she is phrasing the sound. The volume level moves up and down in conjunction with the music to make a perfect unity of the electronic and acoustic sounds. At the end the conductor takes the electronic volume value all the way down before she stops the DAW 3rd button) and jumps forward (4th button) to start the next phrase. This video example shows how the conductor is playing with the acoustic possibilities that open up using the ConDiS. She turns the electronic volume down then a bit up and down before fading it out. This example is from the closing measures of the 2nd. movement. Here there are written instructions for the conductor to activate the volume control and increase the electronic volume level before fading everything out at the end. 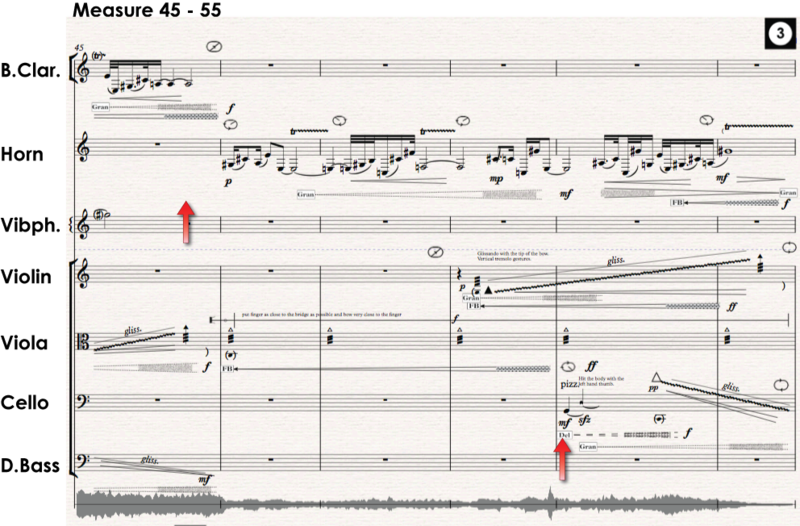 The conductor decides to activate the volume value control earlier than written in the score to have more time to play with the sound. 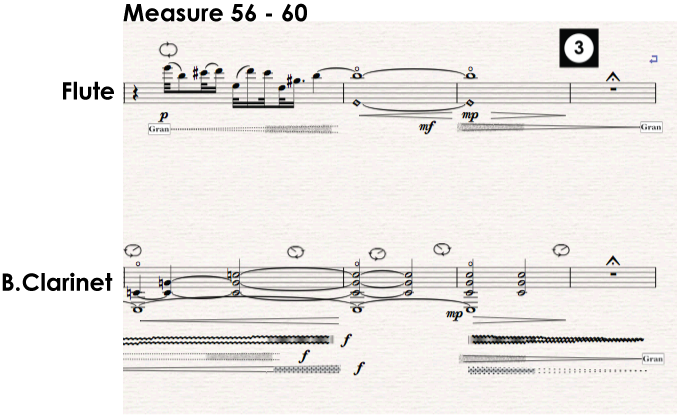 This is something we did discuss during the rehearsals and decided to leave the activation time up to the conductor. Should probably be written into the score. Earlier activation gives the conductor more time to play with the sound and should also be more effective since earlier overall loudness is much higher than towards the very end. Unfortunately, the electronic sound level of the Horn is not very effective and indeed has been like that during the whole performance. Although not a critical part for the ConDiS research, still it should be looked at and fixed before the next performance in November.